What are Family Treasures Worth? I have been lovingly given my Grandmother’s necklace shown in this photo. I have always admired the piece when my mother would wear it and my mom Fifi has decided I can now own and enjoy the treasured necklace. I understand the value of this necklace.But how can you tell the actual worth of a piece of jewelry, china or any family heirloom? The first thing to do is collect known information about the item’s history. Ask family members about the piece.. For example, did Grandma buy her beautiful ring or receive it as a wedding gift? What is the estimated date of its creation or purchase? Who in the family has owned the item? Where was it stored? What is the value? In other words, what do family members believe it to be worth, or what was told of it from one generation to another? Make note of any stories about the item to pass down with the item to your grandchild. The monetary value may be one thing to determine but the true value is the sentimental value. Who in our family has owned and loved this piece and how can the next generation learn the value of treasures from Grandma. My mom Fifi remembers going to the jewelry store as a young adult with her parents and seeing her beloved father Rocco purchase this necklace for her mother Angela.I cherish the fact this valuable heirloom has been in our family for over 65 years and will be handed down to my grandchild. The value of this necklace is priceless. 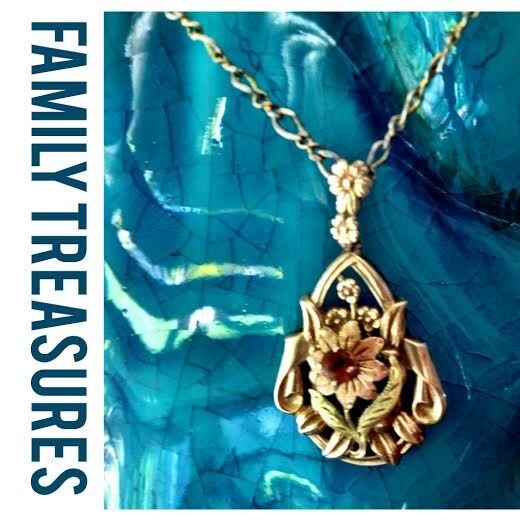 What family heirlooms do you own and what will you tell your Grandchild about the treasures ? My grandmother’s Project 296 is named for her Ohio address. She invites one of her children per weekend to help tackle a closet or a section of the basement. (Only one—any more, she says, and they’ll stay up late talking and lose focus.) With their help, she’s digitized her photos and recipes and made books that tell family stories, like the reason we eat oysters on Thanksgiving. And she’s assigned colored Post-it notes to each kid’s family, which we can use to claim furniture we’d like to inherit. I’ve got my eye on the four-poster bed my mom slept in as a girl. Love this Dawny!! MaryBeth﻿ and I both have a piece of my Nana’s engagement ring. I would have to confirm with my Uncle, but my grandparents would have gotten engaged in the early 1930’s I believe. Her diamond is the centerpiece of my wedding ring and I then had MaryBeth’s birthstone put into Nana’s setting. My wedding ring is my most treasured piece as it contains the love of SO many amazing people. Did you know that Frank’s wedding ring is melted into the inside of Kevin’s wedding ring? Kevin has his dad with him every minute of every day and I know how much it means to him. I received a very special gift for Christmas this year. My daughter Mary Beth had always loved and admired her grandparent’s crystal candalabras. After they passed we gave these to her. Sadly, she has never had the right place to display them. This past Christmas she took a crystal from the candalabra and made me a beautiful necklace. What a wonderful surprise with so much meaning. Grandma saves her grandson’s life !